The LMS version of the drag and drop template is identical to the original in the way that it works and the options you can set to control it. Therefore, this part of the tutorial does not include how to adapt it. You might want to go to the cloze section to revise how it works. This version is mentioned near to the bottom of the page. This template includes an additional piece of code that is called when the activity is complete to send the score to the LMS. This score is then returned to the teacher. As in the other sections of this tutorial, all the code is Flash MX. So, if you are using the huge number of versions that follow - best of luck! Create a work folder for your project. Download the flash template file from here by right-clicking on the link and saving it in the work folder. Load it up into Flash. 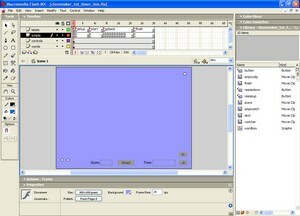 Select frame 1 in the scripts layer on the timeline. Press F9 to display the Actions window. Check that you are viewing it in Expert mode - the View options button is top right of the actions window. At the top of the Actions / code window is the first additional bit of code. Now, I have to come clean and admit that setting this variable to true is based on an assumption. Really, we should call a function that has a go at communicating with the LMS and returns true or false depending on its success. Indeed, this is what we would do if we were using Flash's own LMS functions and building our own learning package. However, we are relying on eXe to do all of that automatically for us. Not because we are lazy, but because we are teachers and we have more important stuff to do than all that geeky stuff. So, setting the variable to true is only telling our movie that we want it to operate inside an LMS. In fact, if we set it to false, the movie would operate as a stand alone drag and drop activity, it won't attempt to talk to the LMS and everything will work in the same way as the standard drag and drop template. This means that we can use the same template for both whiteboard activities (= false) and homework assignments (= true). The idea behind this version of the cloze template is that there is a separate text file called clozetext.txt. This is edited using your favourite text editor (e.g. notepad). You therefore do not need to edit the Flash file in any other way. However, there are constraints in that the file has to be called clozetext.txt unless you want to edit the Flash file and it complicates the production of the eXe package a bit later on. This version is the cut down one that asks you for only two variables. You can edit the .fla file if you want to alter the rest of the activity's look and feel. However, you only need to do this once since the same .swf file you produce can then be used for every activity. Download the clozetext.txt file and save it in your project folder. fontsize=0&clozeText=This is some text to test if the #cloze can find the #text file. fontsize=0 is used to set the starting font size of the activity. If you leave it as =0, the default font size (20) in the movie will be used. Alternatively, you can set it yourself e.g. =16. Either way, the user can later it on screen when they do the activity. One thing that you must not do is remove the & symbol. It is used by Flash to determine where one variable ends and the next starts. clozeText= sets the variable containing the activity text. Don't put it in quotation marks but do use a # immediately before a word you want to be a gap and a @ if you want to force a new paragraph. Everything else should be treated as plain text. The only other addition to the Flash template is a message that is displayed when the last word is correctly placed. Press F11 if the library is not already displayed. 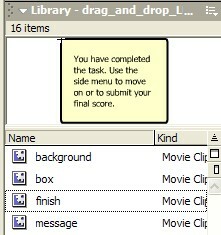 The message that plays once the user has completed the task is called finish. This movieclip is appears on the screen if the function is called to pass the score to the LMS. 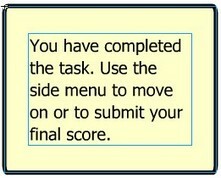 Given that your LMS might display the task differently, you might need to edit the message. Double click on the icon beside finish to load it in the editing window. The text is on the text layer. Double click on the text box to edit the text as is appropriate to your LMS. If you want to edit the background layer, you may need to unlock it first before resizing or altering its colour scheme. Finish editing the movieclip by holding down the Ctrl key while pressing E.